MANILA -- The Armed Forces of the Philippines (AFP) on Friday clarified that it is not discounting the possibility the twin blasts that hit a church in Jolo, Sulu is the handiwork of suicide bombers. "The AFP has not since ruled out the possibility of suicide bombing. We are, however, still pursuing leads from the ongoing investigation and testimonies of survivors that point to other possibility that it may not be suicide bombing," said AFP spokesperson, Brig. Gen. Edgard Arevalo in a text message to reporters. Arevalo was reacting to the Sulu police’s claim that the January 27 attack that killed 22 persons and wounded at least 97 others is a case of suicide bombing. "The President and Commander-in-Chief, Rodrigo Duterte has made a declaration that the Jolo blast is possibly a handiwork of suicide bomber(s). We say that he has access to various — even unlimited — sources of information. And that possibility is among the focus of our investigation," he added. Regardless of who perpetrated the brutal attack, Arevalo said the entire military is committed in neutralizing and prosecuting these terrorists for the murder of churchgoers. "There may be a breach of security but not security lapse. A truism is that there is no impenetrable barrier. The AFP may have foiled 99 out of 100 attempts; but a singular successful try doesn’t mean government security forces have been remiss of their job. 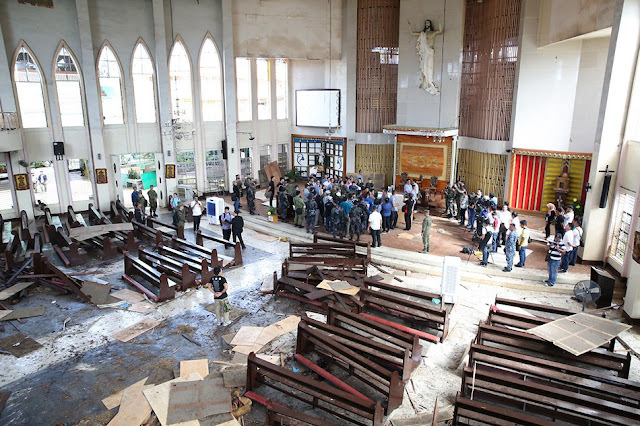 The fact that five soldiers, now six, made the ultimate sacrifice during the blast prove that they religiously performed their level best to protect and rush to the rescue of the victims of the blast," Arevalo said. He said they need the utmost cooperation of people to comply with the security measures being implemented by security authorities.